The northerly wind whistled over the flat plains of East Anglia, bringing a definite chill to the air on Saturday morning as over thirty Finns started to rig up for the first event of the 2016 BFA Travellers Trophy. 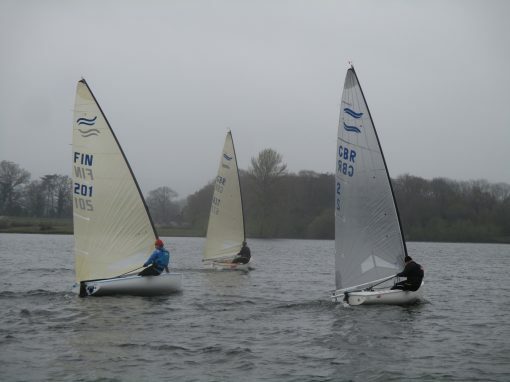 The Alton Water sailing centre website stated the measured temperature was 5 degrees giving all the sailors more than just the perception of cold! The synoptic chart showed a cold front passing over as it weakened from the North West, with a complex set of systems to follow meaning; that the conditions for both days were hard to be predict with great certainty. The dinghy park resonated with the news of a bad winter of very little sailing, with either too much or too little meaning that Finn sailing had taken a back seat for many months. However, for this weekend the weather gods were kind, and by the time of the first start the breeze had settled to between 8 and 12 knots north westerly. 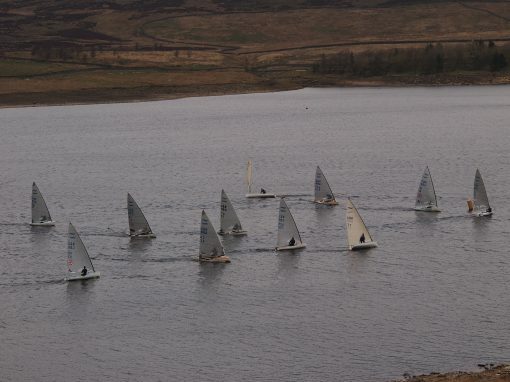 The first race got underway promptly, with the windward mark in the middle of the cut into the further northern reaches of Alton Water. A few sailors, both young and old made good use of left hand pressure along the shore at the port lay line, with U23 sailor, Hector Simpson leading the charge. James Downing kept the Open fleet challenge up, with Masters sailors Allen Burrell and Robert Deaves. The patchy downwind conditions made for gains for some and losses for others. With the pumping rule turned off on the second with U23 sailor Matthew Stevens rounded off the top 5. An icy shower passed over the fleet as they waited for the second start, before the breeze flicked right then left then right again before reducing in strength, presumably the front passing. The second race got underway in the lull between shifts. A tricky first half to the beat saw Cameron Tweedle giving a master class in getting to pressure first. Using this pressure he sailed to a convincing win. The results show that Allen Burrell and Richard Sharp rounded the first mark, deep in the pack, but finished in the top three. This was a learning experience for everyone that every place is hard fought in this fleet, with may of the expected leaders picking up their poorest result! The breeze filled and the temperature increased a little as conditions transitioned to free pumping and the Oscar flag took over on the committee boat. Despite the increased breeze, getting off the start line proved an important priority. Establishing freedom to take the shifts was critical, and in the fresher breeze the early parts of the race was again dominated by the new U23 squad. Hector, Calum Dixon, and Cameron showed great upwind speed and awareness to lead from a group of Masters and Open sailors. The downwind pumping saw Hector and Calum hold and extend their positions at the front of the fleet, whilst Colin Leonard and James Downer caught up to the lead group before advancing to third and fifth respectively. London based Finlander, Kristian Sjoberg was the fourth member of the top 5 after not missing a shift the whole way round. Weary bodies started the fourth race, with Hector and Calum again showing good pace, height and tactical awareness to make the lead brace from start to finish. 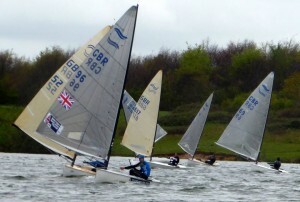 Colin showed a useful turn of pumping pace to escape from a pack at the first windward mark into third, whilst Cameron and James fought it out with Martin Hughes. Grand Master, Martin showed that wind awareness and economising effort can be quick, if not quicker than pumping the wrong way! A good, and mixed first day saw Hector clear in the lead, with his youthful peers counting good races. A night of great craic, and race analysis was had over fish and chips in the King’s Head. The promised frost was as hard as anticipated, especially for those who slept in their cars or camped in the clear night sky. 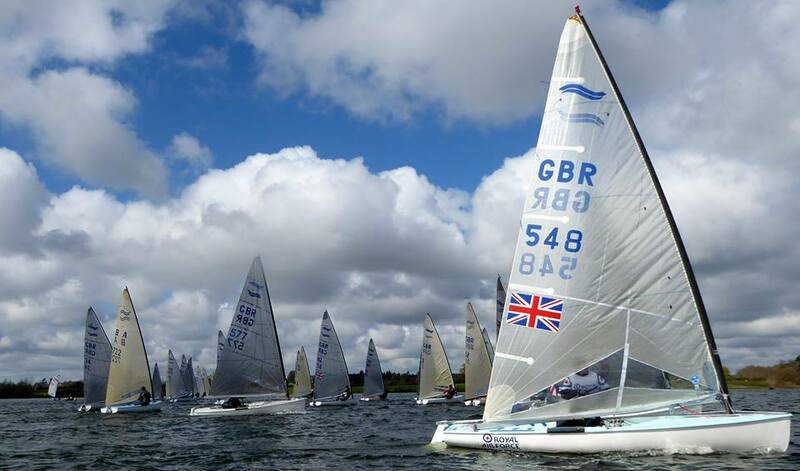 Sunday greeted the sailors with a brisk 12 knots at 07:00 but this had dropped to 8-10 by the start of racing. The forecast was for a further reduction in strength to nothing by mid-afternoon. Race officer Martin Pavey, wasted no time in utilising the great sailing conditions. It was even sunny! Hector resumed service by moving swiftly through the fleet after a challenging start, followed by Matthew, who was to show that Saturday’s ups and downs were a momentary blip as the day went on. Local knowledge and racing savvy saw Will Patten and Robert Deaves round out the lead pack. 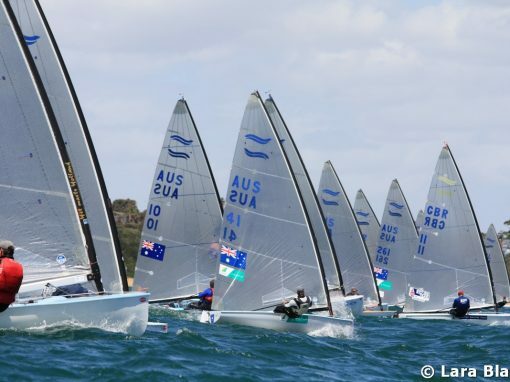 Just as Matthew was starting a dominant day on the water, Cameron was starting to have a series of bad luck that saw him in the lead pack in every race only to get caught by the increasingly varied shifts, puffs and lulls! Despite this his first beat and general good boat speed are definitely one of the stories of the day. Elsewhere on the race course, balance evaded Calum as his boat sailed gracefully on for a few boat lengths when he fell out backwards on the first run, he definitely needs to improve his front crawl as he put some significant effort in to catch and get back into his boat. Alton Water looked a bit murky for scuba diving, obviously he felt differently! Race 6, the second of the day saw Colin and Cameron picking shifts left of centre to be in a significant lead. The contrast between Colin pulling on sail controls and pinching and the power of the U23 squad upwind meant that speed differences swung back and forth. After challenging down wind legs, with pressure from behind having a concertina effect, complacency or bad luck (it’s a matter of perspective) saw Matthew, Martin and Allen on a thirty degree lift with more pressure, sailing through at the top of the last beat to a huge lead. With Matthew taking a commanding lead followed by Martin who had left Allen well behind but contrived to lose a significant advantage to be piped at the line by Allen for second place. 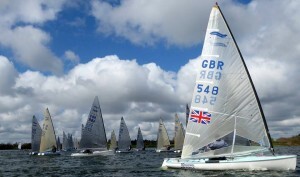 The third race of the day, race 7, started in bright sunshine, and again Colin lead from the middle of the start line. This time chased by Matthew, and Hector who had been a little further right when the last shift to the top was a left hander, with Martin finding a big lift on the left of the course to move from about tenth to fifth at the windward mark. The more practiced boat handling of the young sailors enabled Matthew to overwhelm Colin to sail to a well-earned victory. In the second group, Cameron, Robert and Martin had a battle down the last the run, with Cameron trying hard to throw away his fifth place only just edging Martin out at the finish. The race ended as the sun crept out from behind a cloud, with the wind vanished. Some bad behaviour on the start line meant for a second attempt following the second general recall of the weekend with the main protagonists squabbling at the pin end of the line. All except Allen Burrell, starting at the unflavoured committee boat end, who with consummate ease slid into the new pressure minutes before anyone else and worked the patchy shifts to a huge first beat lead. Colin and Hector were chasing hard down the first run, with a group to the left of the run losing out. This was how it stayed until Colin made the school boy error of not covering Hector on the last beat. It was not to matter, as Hector was a clear and deserved winner. Colin shook of the rust of a year without racing the Finn to take a first podium at an open event and Matthew showed that when it comes to shifts, he won’t miss many! 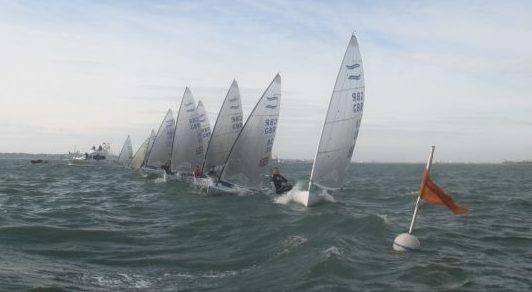 All round a great weekend, with huge jumps in speed from the new young faces of the fleet, and some Open and Masters sailors showing they still have some tricks to learn, but also there are many more tricks up their sleeves. For example, Martin downwind, even if he claims it is the new Petticrows boat and Robert’s upwind shift management spring to mind As always the camaraderie and as we say in Ireland, ‘craic’ were mighty, and great to see some die hard sailors camping in the mud bath of the car park. True dedication. The prize giving saw fantastic prizes from our sponsors, Digital Copy IT, and Sea Mark Nunn, for sailors throughout the fleet. Finally Alton Waters Sailing Centre Chairman sent us away with warm wishes and a promise of a warm welcome on our return. I am sure that we would all look forward to returning to this tactical venue that puts a high premium on our boat handling – the perfect practice for the start of the season.